The Inuit discovery of Scotland certainly took place in 1682, but it may have happened earlier. How much earlier is not clear. Wallace recorded the Inuk as ‘Finnmen’, a local term that associated them with Finland, but he had read widely and correctly identified their origin as Inuit from Greenland. ‘Sometime about this Country are seen these Men which are called Finnmen; In the year 1682, one was seen sometime sailing, sometime Rowing up and down in his little Boat at the south end of the isle of Eda[y], most of the people of the Isle flocked to see him, and when they adventured to put out a boat with men to see if they could apprehend him, he presently sped away most swiftly: And in the Year 1684, another was seen from Westra[y], and for a while after they got a few or no Fishes: for they have this Remark here, that these Finnmen drive away the fishes from the place to which they come. It is not clear from Wallace’s account whether Inuk had previously visited Orkney. Some writers have speculated that the individuals found in the 1680s had escaped from European captors. 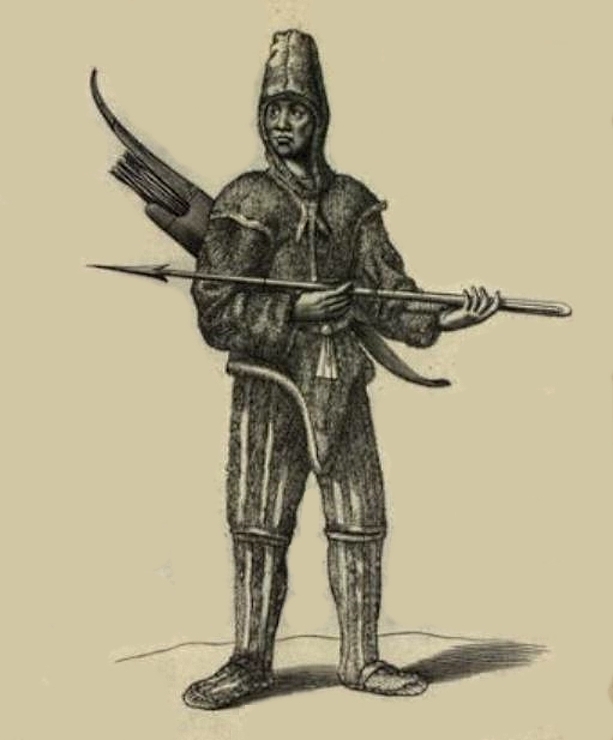 That may be true, however, Wallace’s account indicates that they appeared with their boats on three occasions and that, in at least in two of those cases, they had the hunting implements needed for fishing. Further sightings in Orkney were reported in 1701 and Aberdeen in 1728. The Inuit encounter of 1684 may have taken place during the Great Frost of the winter of 1683 to 1684, but no month is given. It is also possible that it was a long-range summer hunting expedition. Right now, Olly Hicks and George Bullard are using a kayak to retrace the epic Inuit journey from Greenland to Scotland. Charles du Rochefort’s Histoire naturelle et morale des iles Antilles de l’Amerique (Rotterdam, 1658) was translated into English as The History of the Caribby-Islands. In the eighteenth chapter of the English version, from page 110 onwards, is an account of a voyage in 1656 to the Greenland coast of the Davis Strait. There are parallels between Rochefort’s and Wallace’s accounts. In both cases the arriving party was greeted by curious locals launching boats. They were also both in pursuit of resources. The European voyagers left with what they hoped was silver ore – they were to be disappointed by the results – the two Inuk hunters left with fish. For other wonders of the 1680s, see here. ~ by drmarkjardine on July 26, 2015. Interesting that these dates would appear to correspond with the Little Ice Age, also I recall seeing a sealskin boat in the Aberdeen museum at Marischal College, that had washed up along with its owner at Peterhead, the man was apparently extremely fatigued and died soon after. Tantalising fragments … John MacAuley has done an interesting wee book about the Finnmen, and others: SEAL FOLK AND OCEAN PADDLERS – Sliochd nan Ron (White Horse Press). According to oral tradition in my family I am the descendant of an Inuit. There were 7 Inuit brothers who left Greenland as crew on a Whale ship. 5 of the brothers drowned at sea of the 2 who were left 1 settled in Denmark and my ancestor settled in Scotland. The story is from my grandmothers family some of whom were Thomson from Orkney. I have tried to examine and contacted various sources to establish some credence to this but so far I have hit a brick wall. The last thing to do is to have my DNA analysed.